Centuries ago, the ancestors of the Pueblo Indians lived spread out among the valleys and plateaus of the region, hunting and gathering wild plants and seeds, then migrating elsewhere as the seasons demanded. With the acquisition of domestic seeds for corn and other crops, they gradually became farmers, which allowed them to remain in one place and build permanent shelters, originally pit houses. As they farmed the plateau and bottomlands of these canyons, they built villages of separate stone houses, and eventually created multi-storied pueblos under the natural shelter of cliff walls and overhangs. But after only a few decades, they disappeared and abandoned these dwellings forever. Pueblo cultures varied throughout the Southwest. Archeologists use pottery style and decoration, as well as architecture, to divide the cultures of the region into 3 branches: the Chaco, the Mesa Verde and the Kayenta Anasazi. Here among the Kayenta peoples, pottery styles were vivid and multi-colored. Their buildings were more randomly grouped than those elsewhere, and their social organization was less formal. The Hopi, whose reservation is 50 miles to the south , are believed to be the descendants of the Kayenta Anasazi. The villages preserved at the monument are believed to be paths along the sacred migration route of the 8 Hopi clans. Hopi Tribal elders periodically visit the ruins at the Monument as sacred shrines. The two largest villages here at the Monument are best known by the names given them by the Navajo, who arrived in the 1800s. 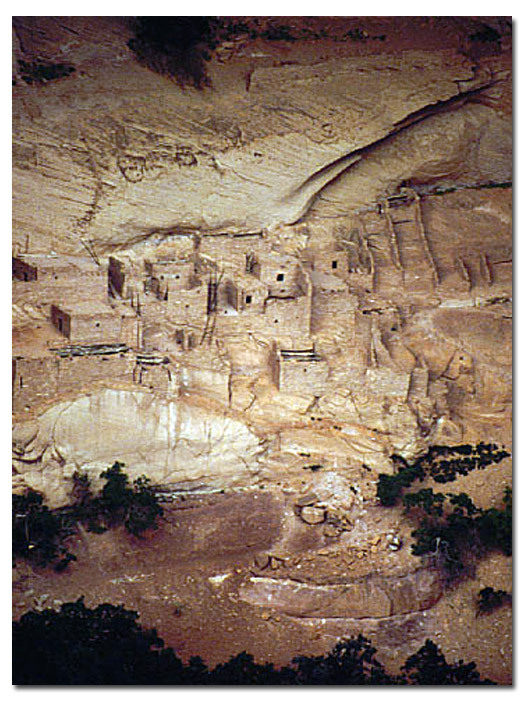 Betatakin means "ledge house;" Keet Seel is from an altered Navajo term meaning "remains of square house." The Hopi also have names for these villages, Kawestima and Talastima. 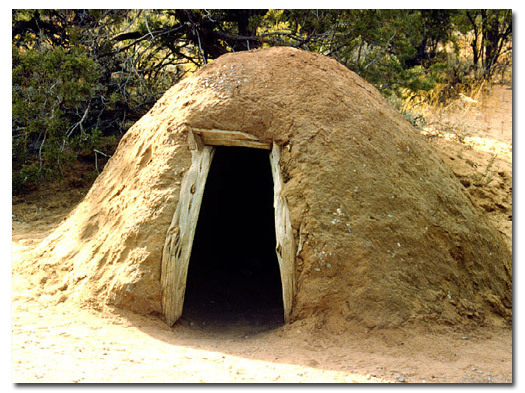 While the Navajo referred to the ancient ones as the Anasazi, the Hopi called them the Hisatsinom. This village was originally occupied about 1250 because of its attractive south-facing alcove. When the last household space was built in 1286, the village was populated with about 100 residents, but by 1300, it was abandoned. This village was occupied much longer than Betatakin.This alcove was settled as early as 950 by those who built houses and kivas. The village was rebuilt in 1250 by different people and, at its zenith, may have contained 150 residents. By 1300, this village, too, was abandoned. The Navajo were Athabascan-speaking people who migrated into the Southwest from Canada about 1500. They lived in alternating peace and war with their indigenous Pueblo neighbors until they acquired the horse from the Spanish and became the dominant culture and a powerful nation. In 1863 and 1864, after the U.S. replaced Mexico as the primary European power in the area, the U.S. Army was sent to end Navajo raids against settlers. After numerous brutal battles, the Navajo survivors were marched 300 miles to captivity near Fort Sumner in eastern New Mexico. This has been referred to since as the "Long Walk" by the Navajo. Under a treaty four years later, the Navajo were allowed to return to their homeland with enough sheep to start anew. Their negotiating skills since, have served them well. Today, some 200,000 Navajo occupy the largest reservation in the U.S., where they remain the predominant population, completely surrounding the Hopi Reservation of Arizona. Navajo National Monument was proclaimed March 20, 1909 by Theodore Roosevelt but is now entirely on the Navajo reservation. Headquarters is on 244.59 acres of tribal land by agreement in 1962; a right of way of 4.59 acres was granted to the U.S. Park Service in 1977. Total acreage is 360, all federal. Like much of this high and dry portion of the Colorado Plateau, there is limited vegetation, and therefore limited habiat for wildlife. Near the springs formed by the contact of two geological formations, Aspen, Douglas Fir, Box Elder, Scrub Oak, and numerous other plants grow. Green lichen appears on many rock surfaces, while Cliffrose, Scarlet Penstemmon, Indian Paintbrush, Smoke Tree, Larkspur, and other spring wildflowers of the Great Basin Desert bloom seasonally. The usual small rodents, rabbits, Mule Deer, Coyote, snakes and insects associated with this region of the desert make this area their home here at Navajo National Monument as well. Navajo National Monument offers one of the best examples of Navajo Sandstone anywhere on the Colorado Plateau. Throughout the Monument, the pale salmon color and stark cross-bedding, together with the gray and pink lenses of freshwater limestone, reveal its usefulness as an aquifer to prehistoric people. This rock formation, created from ancient windblown sand dunes, is the primary geologic component of the Monument. The entrance highway to Navajo National Monument climbs the Organ Rock monocline, rising with the Navajo Sandstone onto the barren surface of the Shonto Plateau. When the plateau was uplifted to its 7,000-foot level, vertical joints were created from the stress which serve as watercourses down which streams run during rainfalls. Many of these streams have pockets in which small pools form during moister times of the year. Betatakin Canyon, visible from the Visitor Center, is a tributary to Tsegi Wash, which in turn flows into Laguna Wash, then into the San Juan River at Mexican Hat. The ruins are located in a Navajo Sandstone window created from arch formation by the erosion of less resistant rocks of the Kayenta formation below.Where the two formations interface, vegetation can be seen because the Navajo formation is permeable and the Kayenta is not. Thus water moves laterally, appearing in springs along the canyon wall. Near the Visitor Center, the highest hills are capped with thin layers of freshwater limestone, probably deposited by ephemeral ponds in inter-dune areas. These limestone lenses can be seen throughout the Navajo Sandstone formation in the Monument.